Microsoft DirectAccess technology in Windows Server 2012 provides a seamless and transparent user experience. All users need to do is login to their domain joined corporate machine with their normal credentials, be connected to the internet, and DirectAccess automatically establishes a connection to the corporate resources. Microsoft DirectAccess helps to lower the internal IT support costs for enterprises. In many companies, a majority of IT helpdesk support tickets are for users who have problems with various remote access technologies. With DirectAccess removing the user component from establishing connectivity, a majority of those cases can be avoided. 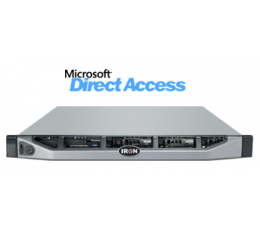 Iron Networks provides a turnkey, single-SKU solution for deploying Microsoft DirectAccess that is easy to acquire and deploy. The solutions are already sized and scoped for various user counts and tested and validated for DirectAccess deployments, cutting out time consuming engineering and testing work needed for software only deployments. Iron Networks has optimized the Microsoft DirectAccess appliance for both security and reliability. Through creating a custom hardened and image with a reduced attack surface, enterprises can trust the URA-DA appliance series meets the most rigorous security standards. Through unified hardware and software support, Iron Networks provides a single throat to choke solution that customers have come to expect from their remote access vendors. Iron Networks knowledgeable support team with years of experience in this technology, makes them an invaluable asset to the enterprises deploying DirectAccess, helping them rapidly solve challenges that arise. 1.7" x 17" x 15.5"